In this blog post, I though of writing something on electric car motor. Specifically, how to select the right electric motor for your Do It Yourself (DIY) electric vehicle (EV). If you are looking for an electric motor, either at a workshop, EBay or on the internet, look for a unit that weights 100 – 150 lbs. Depending on your donor car, if there is a lot of weigh, there would be a lot of inertia and it needs large amount of force to push it around. Imagine this, you don’t want a small and skinny guy to pull on your EV. Probably, you would not want to feed a sumo wrestler either. What I’m trying to say is you don’t want an electric motor that is too small or too big. When you are searching for electric motor, look at the core. Look for insulation that is wine colored with yellow banding. Make sure the brush leads are still copper color and not scotched. 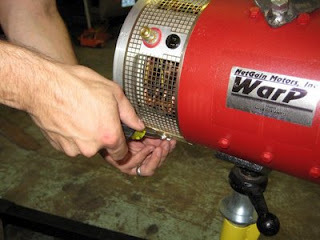 You also want to make sure the commutator is not grooved or pitted. If you want a closer look, just open the cover band and probe inside the electric motor. Here’s another tip. Look for armatures that have a commutator with a large bar count. The larger the bar count, the higher the voltage it’ll take. If you want to build a speedy electric car, this is what you have to look for. If you are looking for a series motor, get one with solid field leads or you might end up with compound would motor that may not suit your DIY electric vehicle needs. One key aspect of selecting an electric motor is the shaft. Make sure you look for a shaft that you think you can attach or modify with a coupler. There are certain motor shafts that aren’t easy to modify. If you make a blunder, that are no “standard” replacement parts either. If you mess up, you might have to discard the whole motor. Choosing the right electric motor for your DIY electric car conversion does not have to be difficult. But you need to think about what you want and also know what to look for. If the information above seems foreign to you, you may want to get some basic knowledge on electric car conversion. In that case, check out Les Oke’s Convert 2 EV.